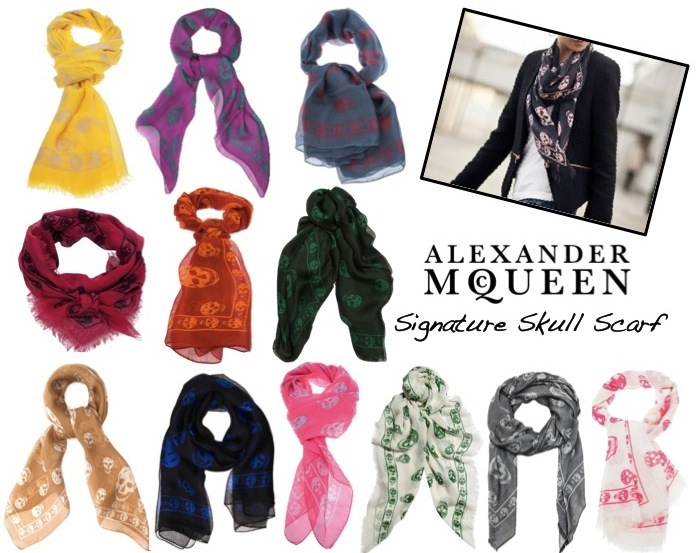 Alexander McQueen's signature skull-print scarves have been a celebrity staple for some time now, gracing the necks, heads and bags of fashionable faces from Nicole Richie to Mary Kate Olsen on a regular basis. McQueen's scarves are perfect examples of "tough luxe" - the skulls make them edgy enough to to wear through the backdoor entrance to an underground turtle racing ring while the luxurious fabrics (and price tags) have no problem fitting in on Rodeo Drive. Now that we're clear that these are completely covetable and obviously obsession worthy, can you guess which one I'm about to pull the trigger on? see here. What's your favorite color combo? I wasn't sure if this was just a season trend or if it was really going to stay. Obviously now it is safe to say they are a staple! Camel is the perfect choice! I've always loved these, but I don't have the money to splurge on one...I actually found a great copy-cat version at a flea market in Brooklyn, so that's satisfying me for no. Can't wait to see how you style it! I cant decide between the pink/grey or the grey/white....ugh I want one so bad! They are adorable, so many colours to choose from as well. You can't NOT like these scarfs! Beaut! You can't go wrong with this scarf! So classic. I love the black and white one. I was addicted to skull prints for a perdiod of time. There's just something about it that keeps you wanting more. Haha. I really like the hunter green one. It's really pretty.